Apple launched its Apple Pay mobile payments service in China on Thursday, opening the door to a vast market of smartphone users, as well as newfound competition in an established touchless systems segment leaders Tencent and Alibaba. Apple's service debuts with current and planned support for 19 of China's largest lenders, including day one support from market leader Industrial and Commercial Bank of China Ltd (ICBC), Reuters reports. 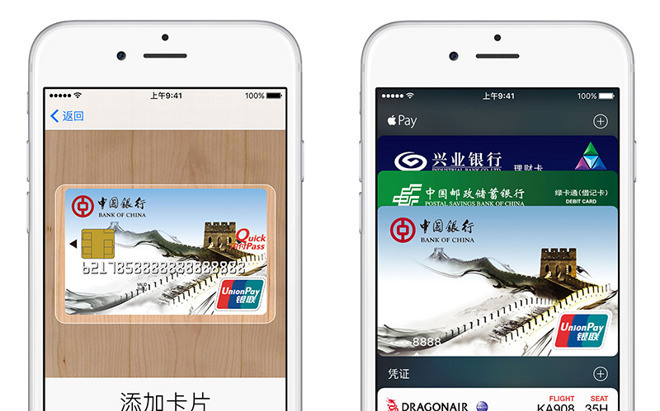 "We think China could be our largest Apple Pay market," said Jennifer Bailey, Apple's VP of Apple Pay. According to Apple's regional website, a total of 12 banks are part of today's launch, including the Agricultural Bank of China, Bank of China, Bank of Shanghai, China CITIC Bank, China Construction Bank, CGB, China Merchants Bank, China Minsheng Bank, ICBC, Industrial Bank Co., Ltd., Postal Savings Bank of China and SPD Bank. Banks scheduled to launch support in the near future include the Bank of Beijing, Bank of Communications, Bank of Guangzhou, Bank of Ningbo, China Everbright Bank, Huaxia Bank and Ping An Bank. With Apple's initial slate of partners, powered by China UnionPay processing, 80 percent of China's credit and debit cards can be provisioned for use on Apple Pay. On the retail end, Bailey said about one-third of all merchants capable of processing said cards will also be able to accept Apple Pay payments. On the list of supporting stores are 5Star.cn, Mannings, Lane Crawford, all days, Carrefour and the usual players Apple Store, McDonald's, Burger King, 7-Eleven, KFC and more. While it will be going head to head with payment systems operated by Tencent (WeChat Payment) and Alibaba (Alipay), Bailey said Apple is not looking to compete with banks or China UnionPay. "China UnionPay and our Apple Pay solution has a huge advantage, given the footprint of China UnionPay," Bailey said said. "Its merchant acceptance network far exceeds what any of the other mobile platforms have today." In a related announcement, Apple informed developers that in-app Apple Pay payment support is now live. "You can now support Apple Pay for your customers in China, providing an easy, secure, and private way for them to pay using their China UnionPay credit and debit cards. Apple Pay lets users buy physical goods and services within your app without having to enter payment or contact information," Apple said. For the Chinese market, in-app payments are processed by CUP, Lian Lian, PayEase and YeePay. Apple Pay was announced in 2014 as an NFC-based, Touch ID-protected payment system for iPhone 6. The service went live with the release of iOS 8.1, later expanding to Apple Watch and in-app payments on Touch ID-equipped iPads. After a domestic rollout, Apple Pay launched in the UK last July, followed by Canada and Australia in November.